Yarn and Fiber Happenings: Winter Knitty is Up and You Have to Check out Jeanie! Winter Knitty is Up and You Have to Check out Jeanie! Wow! Another great issue put out by Knitty.com has just been released! And you have to check out Jeanie! What a fabulous shawl made with only three skeins of Dream In Color Smooshy Dusky Aurora! A must have for all shawl wearers! Other news for the Yarn and Fiber Company - Kauni Effectgarn is on the way! Yay! After seeing the cardigan on the Rainey Sisters blog, it was a must have! 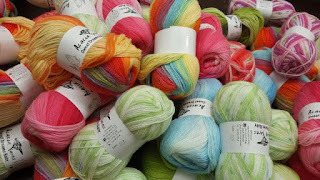 As soon as the yarn arrives, we will post the colorways. If you have a certain color you want held, email us and we are happy to take your preorder.